Euonymus alatus (winged spindle / fire bush) at Crocus. 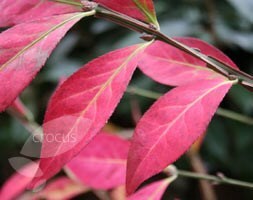 A good colour bush that is slow growing so won’t overtake your garden. A dense, bushy, deciduous shrub with dark green leaves turning brilliant shades of strawberry-red in autumn. This winged spindle is named after the large, corky wings that are revealed after it has shed its leaves. Best planted in an area where the sun catches the spectacular autumn foliage, it makes an excellent specimen plant for a well-drained shrub border or woodland edge. Garden care: While the plant is dormant in late- winter or early-spring remove any misplaced or crossing branches and older stems to achieve an open, permanent framework. Apply a generous 5-7cm (2-3in) mulch of well-rotted garden compost or manure around the base of the plant.